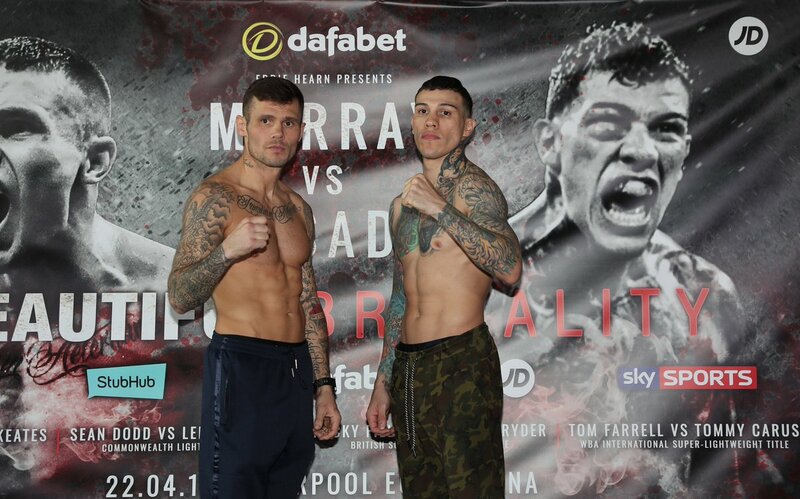 Martin Murray and Gabriel Rosado both came well within the middleweight limit for an April 22 crossroads clash that presents a must-win scenario for both boxers. While a regional title has been placed at stake, the real prize for the winner is simply a victory. That aspect clearly wasn't lost on either veteran contender, as both hit the scales in supreme condition for Saturday's main event at Echo Arena in Liverpool, England. Murray checked in at 159.2 lbs., the lightest he has weighed for a prizefight since a June '14 win over Max Bursak back when he was a full-time middleweight. Rosado registered at a ripped 159.3 lbs. for his first career fight in the United Kingdom. The bout will air live on Sky Sports in the United Kingdom. Murray (34-4-1, 16KOs) has come up short in four career title fights, including three at middleweight. He was viewed as the unfortunate victim both in a 12-round draw with Felix Sturm and narrow split decision defeat to Sergio Martinez - both taking place in the defending middleweight champions' respective home countries. The now 34-year old Brit also dropped a very competitive decision to Arthur Abraham in a failed bid for the super middleweight title in Nov. '15. Among his most convincing defeats, however, were two bouts that altered his career. Murray was viewed as valiant in defeat in his 11th round stoppage at the hands of unbeaten middleweight champ Gennady Golovkin in Feb. '15, after which he and his team decided it was best to compete in the super middleweight division. He has fought at or above that divisional limit in each of his past seven starts, including a 12-round points win over Nuhu Lawal last November. However, that victory was preceded by the revelation that he can no longer compete with the best super middleweights as evidenced in his decisive points loss to countryman George Groves last June. It wasn't fully decided at the time in which direction he would take his career, but dropping down nearly 10 full pounds for the chance to face Rosado is a clear indication that he can still fight at middleweight. Saturday night represents a far greater must-win scenario for Rosado (23-10-0-1ND, 13KOs), who is in great need of a career turnaround with just two wins in his past seven starts. The 31-year old Philadelphia native - who has spent the past several years in California while capitalizing on acting and modeling opportunities, including a supporting role in the smash hit 2015 boxing film "Creed" - has shown no fear in his 11-year career, but the unfortunate reality is that he has fallen well short in his most significant fights. Still, he's managed two shots at the middleweight title, though both ending in stoppage losses. His bravery far exceeded his ability to compete in a 7th round stoppage loss to Golovkin in their Jan. '13 title fight. Still, he bounced back strong in what should have been a clear-cut win over J'Leon Love less than four months later. The judges did their best to steal it from him, but the split decision loss that was announced that evening was changed to a No-Decision after Love tested positive for a banned substance. His 2013 campaign ended with a second title shot - and with zero wins on the year when all was said and done as he was stopped in 10 rounds by Peter Quillin. Two more losses were tacked onto his ledger before making significant changes in his career which led to a points win over Joshua Clottey in Dec. '15. He added another victory before falling miserably short versus Willie Monroe Jr. last September. The defeat prompted questions of whether he would consider resuming his career, which only adds to his desire to come out victorious on Saturday as he enters hostile territory in fighting outside of the U.S. for the first time.